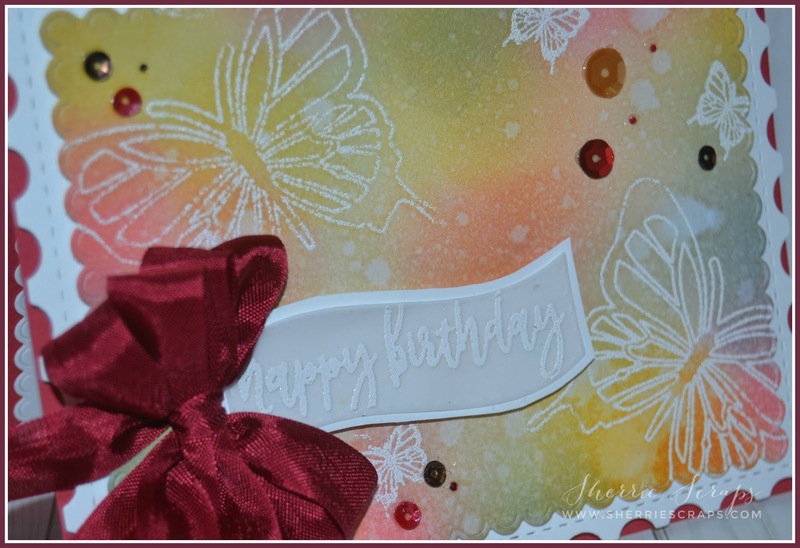 Your card is sooooo PRETTY Sherrie! I loved the distressed blended background and those butterflies are so pretty with the white embossing... Just a lovely card!! Have a wonderful weekend! Wow, Sherrie, this is so stunning!! The background looks amazing!! I'm embarrassed to admit I've had Distress Oxides for a while now (I'm talking like a year!!) and I haven't even taken them out of the plastic wrappers!! How sad am I?? You've inspired me to finally break them out and play!! I love the pretty butterfly fluttering about and the gorgeous bow!! It's so artistic and gorgeous!! I love it!! Beautiful card!! Love that bow! This is gorgeous! LOVING the colors and those butterflies!!!!! WOW! This is so beautiful,Sherrie!! Since I am a bow fan I have to begin by saying... I absolutely LOVE your gorgeous bow!! Love it!! The backgound is beautiful.I recently got some distress inks and I am looking forward to playing with them this weekend. Love the pretty sequins too! Awesome job my crafty friend!! It's raining over here and well today is cleaning day for me (Its usually Saturdays) then off to crafting..hopefully! What a beautiful card!! Love the gorgeous background and the pretty bow!! Have a great day. Your card is lovely Sherrie! Love the background! Sherrie, you always have the best crafty stuff. Love seeing the things you use to create. Your card Is gorgeous! Love the background. Happy Day to you friend. 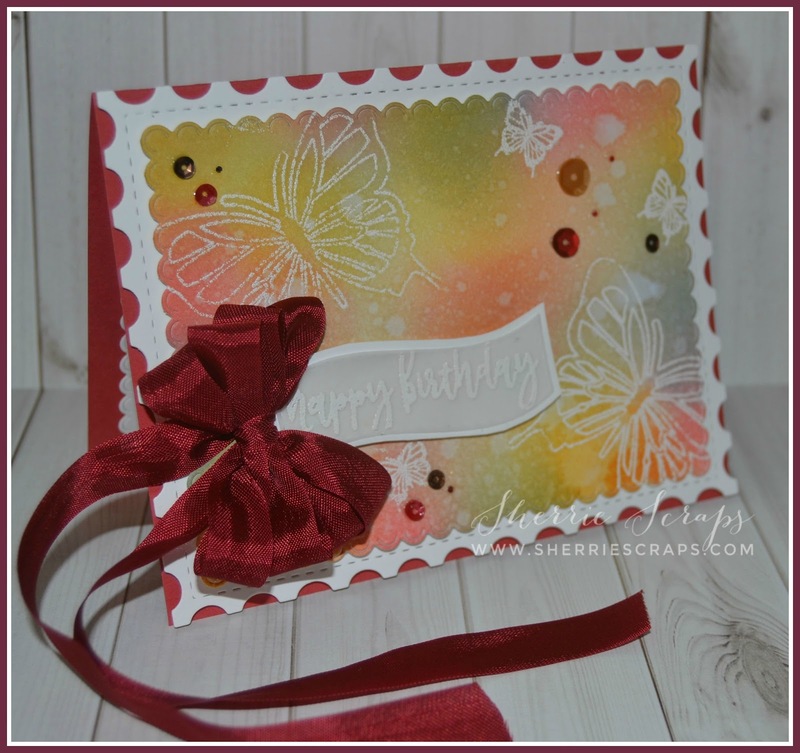 What a pretty Distress combo, and what a gorgeous card! 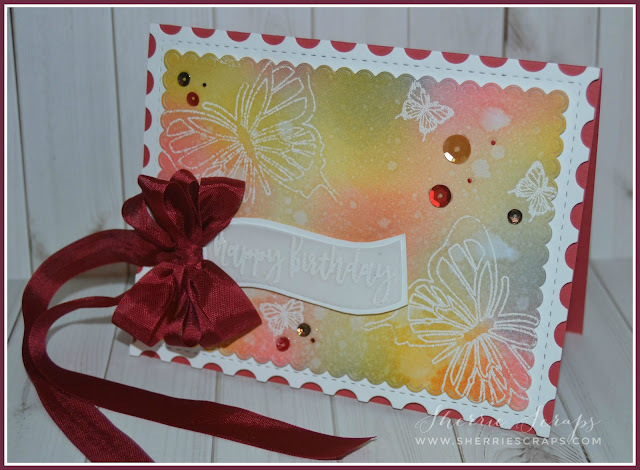 I just love the heat embossed butterflies with that watercolor background!